Richard the Lionheart, brother of the unpopular King John Richard was a commander during the Third Crusade. He led the campaign after the departure of Philip II of France and won considerable victories against Saladin, although he did not succeed in retaking Jerusalem. 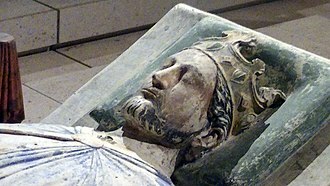 He was king for 10 years before his death in 1199. Although seen as a hero, he used the country mainly to fund his armies. On the other hand, though John was much less popular, his Magna Carta was highly significant in that it was an early step in the evolution of the constitution of the United Kingdom. I watched a TV programme about the both. They said King Richard spent few time in England and was attached much more to Aquitaine. >>On the other hand, though John was much less popular, his Magna Carta was highly significant in that it was an early step in the evolution of the constitution of the United Kingdom. He can hardly be credited for it: his barons forced him to sign it, that wasn't a voluntary act.